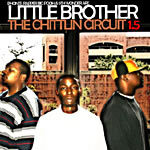 The official re:release of the popular indie mix, Chitlin Circuit! This time around you get 7 NEW TRACKS! Little Brother heads scoop this one up while you wait for the Minstrel Show!